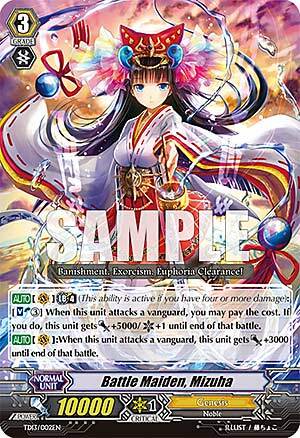 [AUTO](VC) Limit Break 4 (This ability is active if you have four or more damage):[Soul Blast (3)] When this unit attacks a vanguard, you may pay the cost. If you do, this unit gets [Power]+5000/[Critical]+1 until end of that battle. ...the first thing this card reminds me of is Diarmuid as it's almost the same effect word for word except you Soul Blast 3...which is actually worse as you should be conserving the bigger/better Soul Blast costing effects. In short, it's only needed for people who can't afford the soon to be new ace of Genesis...so basically, a budget deck. It's a short review, but this is just an overall mediocre card. Next Time: How does one control trees?? ...Yup, I think I'll use this phrase from now on. Saves space.